The 2013 Boston Marathon bombing, a horrifying event in and of itself, is a reminder of how scary the news can be when misinformation spreads. When explosions first happened, talking heads began speculating on the culprits and dozens of outlets misreported facts. As developments continued to unfold, newspapers, TV stations and other reporters made social media almost unbearable to follow as it became impossible to know what to believe. Most notably, The New York Post misidentified suspects (on the front page, no less) and inflated the number of casualties, while CNN and the AP were lambasted for claiming arrests were imminent or had taken place Wednesday before the FBI and Boston Police had even named who they were/are looking for. 1. Being right is more important than being first. Being wrong once is a thousand times more damaging to a reputation than being second or third to report the news. After CNN and Fox News misreported the U.S. Supreme Court’s health care decision last year, now everything they say comes with a thought in the back of your mind: “Well, they were wrong before…” Trust takes months or years to earn and minutes to lose. 2. If it’s not your beat, don’t make it your beat. I’m appalled at sports radio jocks, entertainment reporters and other professionals (especially in cities that aren’t Boston) who suddenly think they need to post a play-by-play on events they don’t normally cover. They’re not going to be reliable sources and their followers/readers/fans who want to hear about playoff games or celebrity gossip are going to be annoyed that they’re getting something else. Feel free to post major/confirmed updates or your own personal reactions but otherwise let the news reporters on the scene do their job. 3. Tweeting like you’re the only one with access to information. CNN, ABC, AP and CBS News have a combined 15 million followers on Twitter — for starters. Social media users sometimes feel like they must update every human being on earth with every tidbit that gets tweeted, so that even the most casual news consumer feels like they’re being told the same thing all day long. Phony callers, confused authorities on the scene, honest mistakes in the heat of the moment — just because something’s on a police scanner, doesn’t mean it’s true. Slate points out an interesting phenomenon on Friday where false information that Twitter was getting from the scanner was actually false information that the police on the scanner had gotten from Twitter, including updates from fake accounts. 5. Information, whether true or not, can sometimes cost lives. During a manhunt or a standoff, sharing information about law enforcement locations or maneuvers can tip off the suspects. It’s 2013, so keep in mind they have smartphones and TVs, too. They can see everything that we’re saying about them — and they may thus take action that costs the lives of people who didn’t need to die. Every newspaper, TV station, radio station or news site is aiming to do two things: Inform their audience, and grow their audience. Sometimes to grow their audience (see: make money), they’ll stretch the length of a story or jump on it early with flimsy information. In the case of Boston and the Newtown shootings, “sources” that were incorrect led to false information spreading and innocent people being unfairly accused of crimes. 7. Breaking news that’s already broken. You woke up at 7 a.m. and you’re just now reading a story that started at midnight? Don’t update everyone on the last seven hours. The world doesn’t revolve around your sleep schedule. That said, major brands still sometimes make the mistake of posting tweets about “breaking news” that a) they didn’t break and b) has been circulating for more than half an hour. When news moves at the speed of social media, breaking news is usually broken within 10 minutes. 8. Twitter is like the “telephone” game. “Police are looking for a suspect who is wearing a baseball hat” can quickly turn into “Police have arrested a Boston Red Sox fan” if you’re not careful. Especially when limited by 140 characters, details get left out or changed for the sake of brevity. So when you tweet based on another person’s tweeted info, keep in mind they might’ve based theirs on another tweet and so on… consider it the 21st century version of the “telephone” game. Titanic 100th anniversary: If the Titanic sank today, how would the news break on social media? 100 years ago, the Syracuse Herald and many other newspapers around the world mistakenly printed reports that all the RMS Titanic's passengers had been saved. In reality, 1,514 people died when the 'unsinkable' ship hit an iceberg and there were far less lifeboats than could hold its 2,223 passengers. “Breaking News” and “Newsflash” are almost completely outdated terms in the world of social media, yet “old media” like newspapers, television and radio stations, still use them. They’ll even use the term when someone else has broken the news and it’s all over Twitter and Facebook, hours earlier. Sometimes it’s a result of which sources have the better credibility or a bigger audience — if the Pleasantville Daily News “breaks” something to its 98 followers, then it’s fair to say CNN is actually breaking the news to most people when they pick up the story. Ultimately, though, the desire to be FIRST! in breaking a story is no longer just a traditional media problem. Even Joe Schmo can “break” a story to his 254 Tumblr subscribers if he posts it early enough, which is why news breaks today on the Internet in confusing yet fascinating ways. On the 100th anniversary of the RMS Titanic’s sinking, I wonder how the news on April 15, 1912, would have been covered on social media. Eventually, the true story would emerge, but as the news breaks there’s all sorts of conflicting opinions and reactions that confuse the world wide web. Even before social media, inaccurate reports happened all the time. 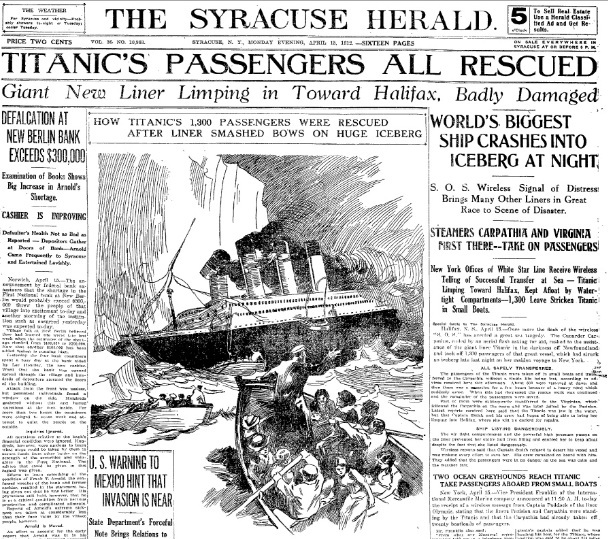 The Syracuse Herald newspaper first ran a front page headline that said “Titanic’s Passengers All Rescued” with a dramatic telling of how they were all taken to lifeboats. Apparently, what happened was: A wireless message went out stating ‘All Titanic’s Passengers Safe.’ A week later it was discovered that this message had been wrongly received in the confusion of messages flashing through the air. In reality the message should have read ‘Are All Titanic’s Passengers Safe? '” Can you imagine THAT going viral on social media? Reporters would lose their jobs and Mashable readers would lose their minds (because Mashable would’ve written a story about it, too, in an effort to get SEO traffic even though they claim they focus only on web/technology news). While many of us (including Titanic director James Cameron) are shocked that some audiences are just now finding out that Titanic was real and not just a movie with Leonardo DiCaprio, can you imagine if the Titanic sank today how it would be covered on social media? Ponder that the next time you see “Breaking News” somewhere on the Internet, and think before you tweet.